Is Wonder Woman a Villain in The Flash Movie? The Flash movie has confirmed Wonder Woman as one of the main characters. But will she play a villain in Flashpoint this time around? 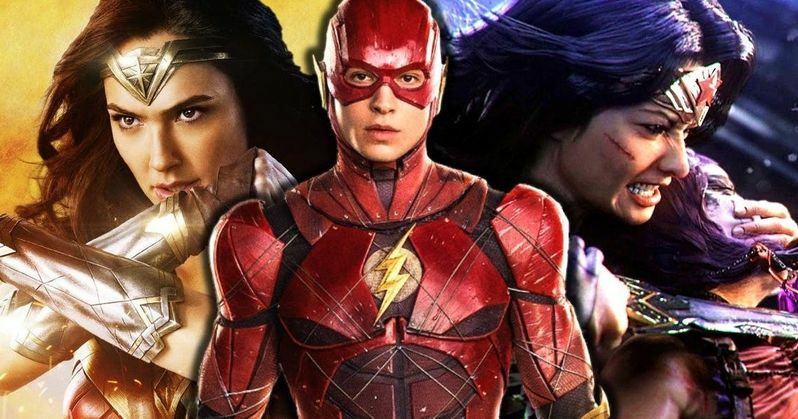 The standalone Flash movie has had a rough take-off since it was officially announced back in 2014, losing two directors and going through many script revisions. It got to the point where Warner Bros. finally just scrapped the project all together. But that all changed at Comic-Con this past summer when it was formally announced that The Flash movie was still happening, but it was getting the Flashpoint treatment instead, which instantly became exciting for fans of The Flash. It would be hard to tell the Flashpoint story effectively without Wonder Woman, so it makes sense that she will show up in some capacity. Wonder Woman is a main character in the storyline from the comics and it has just been assumed since the announcement was made that she would be involved in the project in some way. Cyborg is another DC character who plays a large part in Flashpoint as well, so it seems obvious that he'll pop up somewhere in the movie too. Deadline reported yesterday that Gal Gadot is in talks to sign on to join Bradley Cooper in MGM's Deeper while simultaneously announcing that Gadot is signed on for the Flashpoint movie. But there's a catch if we're going to be looking at the original source material. There are plenty of strange things that happen in the Flashpoint comic series when Barry Allen goes back in time to save his mother. Batman is portrayed by Thomas Wayne and Martha Wayne goes on to become the Joker after Bruce Wayne is killed in the alley instead of his parents. Wonder Woman has an equally bizarre twist that could very well show up in the Flashpoint movie. In the comics, Diana Prince has an affair with Arthur Curry, aka, Aquaman and ends up killing his wife, Mera. Mera attacked Diana, which resulted in her death and kicked off a brutal war between Themyscira and Atlantis. This conflict killed thousands of innocent bystanders, and it began to take over the world as each faction did the best they could to dominate the opposing side. It's entirely possible that the DCEU could flip the script on the Wonder Woman character in the standalone Flashpoint movie. Flashpoint turned the universe on its side in the comics and many are speculating that it can do the same thing for the DCEU. While this is all speculation at the moment, it could go on to further complicate the seemingly unorganized DCEU by flipping the script on some of their most beloved characters. It should also be noted that not much has been talked about for the project since it was announced almost 2 months ago. Instead, Warner Bros. continues to announce projects for the Joker and Harley Quinn, leaving a lot of characters and projects in the dust. Regardless, it would be pretty interesting to see Gal Gadot pull of a villainous Wonder Woman.